The Kiewa Valley was an important place to Indigenous people for over 21,0000 years. Sitting in the bordering territory of the Waveroo, Dhudhuroa and Yaitmathang people, It served as a trade route and the corridor to Mt Bogong : a place of of great importance for tribes to congregate in ceremonious exchange and eat Bogong Moth for at least 4 months of the year. There are places of importance in this valley: the corrobboree ground at Gundowring Lagoons, where Barber’s homestead “Gundowring” now stands and another at Tawonga, so well used that no grass grew for a long time; Mudgegonga rock shelter, pertaining to 3 sites over 400 instances of rock paintings and stencils; clay mound ovens used for cooking at Mongan’s Bridge; Tangambalanga, where a burial ground still stands under the hotel that shares the same name and then there is Dederang Mound. Dederang is smack bang between Mudgegonga, Big Ben and Upper Gundowring. There’s a racecourse, a pub and a corner store. It’s quiet town ,in a ‘blink and you’ll miss it’ kind of way. But beside the cool, green reed beds of House Creek, surrounded by a wire fence, on private property is a mound of no small proportion. 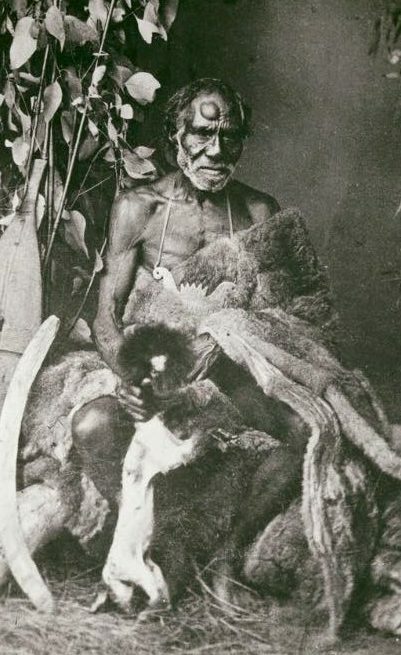 Much has been speculated about Dederang Mound: that it was created the swirling current from a flooded House Creek or is the earth that was moved in the creation of School Creek Bridge or that it was the grave site of a beloved dog called “Rangy’ that belonged to a worker in the early days of colonisation through the Kiewa Valley. But this mound is large: the effort to create such a grave for a pet at a time where a run owner’s day was spent toiling seems farfetched. At Dederang we noticed a peculiarly rounded hillock at the junction of a small creek, strongly suggestive of a terminal moraine. We regretted that we had not time to examine it, but our driver informed us it was locally known as a blackfellow’s mound, one of those monuments which remain of a fast expiring race, a race whose manners and customs have been so ably described by my talented friend, Mr A. W. Howitt, PBL, F.G.S., of Gipps land, in his anthropological works. There are accounts in the Kiewa Valley in the early years of colonisation, local tribes would approach homesteads for food and supplies. Usually the women would be home alone whilst the men- run owners, managers and convict servants, usually with the only fire arms possessed by the household would be working a distance away, for an indefinite period, mustering livestock, building fences etc. In this one instance, a tribe approached a homestead and the woman of the house had supplied them flour from the store- the tribe had gained access and swiped some poison, either arsenic or strychnine, thinking that it was sugar. That night, the tribe had a big feed up of damper, down by the banks of creek- this area was believed to be a corrobboree or camping ground of the tribe. The poison had its way with them: apparently 180 people died. The returning men buried their bodies under the mound and later planted twin pine trees over the top. Apparently the remaining Aboriginal people avoided the area from that point onward. The pine trees are no longer. A pair of gums stand in their place. 180 people seems to be a very particular number to reference in 1981, even after approximately 140 years after this alleged instance took place. The idea that this tribe are a victim of their own thievery seems all too convenient. Poisoning in the Kiewa and surrounding valleys wasn’t a far-fetched possibility: it was effective technique of killing unsuspecting hungry people, en masse. Even isolated women on homesteads, with no access to firearms, could do it. A far less confrontational and final attempt at dispossession. Aerial shot of Dederang Mound. It seems unlikely that roadworkers would cart such a large amount of earth such a distance when the bridge was made. The mounds size is almost the same size as the dwellings near by. There are also other mounds in the North East that did have human remains contained inside: my friend, John Murphy (Corryong Man From Snowy River Museum and local historian of things Indigenous ) told me of a mound at Old Nariel Station, near Corryong. John gave an account that the mound was conical in shape and was disturbed when a fence post hole was being dug out: a human skull rolled out. It was taken to the local Police station. The mound was flattened by the run owner and is no longer. Uncle Wayne Carroll from Mungabareena Aboriginal Corporation at Albury also told me of similar mounds over Balranald way. I also remembered reading a paper amongst some documents given by author and researcher Maree Hansen Fels, where there was an accounts of similar death mounds in the Ovens, the next valley across from the Kiewa. The dead were placed in a cross-legged position, sitting upright, and surrounded by earth, resulting in a conical mound shape. The person making the account questioned the effectiveness of such a grave on a flood plain – but the use of a heavy tree bough kept the structure anchored was the explanation proffered . This made me think of the trees planted on the mound positioned so close to a creek at Dederang: was this used to keep the structure anchored and contained? Had the mound ever been examined? Authors Stiff and Caldwell referenced in their local history book that the mound was examined in 2002, but the results were inconclusive. Dr Michael Westaway was the consulting archaeologist. I reached out to him. Westaway said that the mound was massive, and he found it intriguing. He showed images of it to a geomorphologist and he was very dismissive of it being a cultural feature: Westaway can’t quite recall what his explanation was as to why the geomorphologist came to this conclusion. Westaway also stated that the two large trees would have had a complex root system that would complicate a Ground Penetrating Radar reading. Things aren’t usually known unless there is an actual excavation done. He wrote a report for Aboriginal Affairs Victoria, but no longer has a copy. My friend, Belinda Pearce took me to Dederang on our way back from a trip to Mudgegonga 2 years back. It was a hot day, and we stood under the plum trees at the start of the dirt track that flanks the mound. The property owner has taken care to ensure that the mound is protected by a wire fence and had replaced the trees- you can still see the pine tree stumps on the top. Research takes me to many cemeteries and gravesites. What caught me off guard was I started to feel uncomfortable here; feverish. It was eerie. I’ve been back to see the mound again. My feeling is if my Ancestors are resting here, they should be let be. As an indigenous Irish man whose ancestors were similarly exterminated by the imperial British empire of the time I do feel your pain . Previous Digging up the past and correcting the mistakes: Elengeit’s breastplate- continued..
Next Duplicity and Cunning at Lake Moodemere: The Kitty Brangy photographs that did not exist.